“I can stop it,” says the police lieutenant. In the office of The National Commission. Willard Robertson standing; David Landau seated across from him. The lieutenant interrupts once more to tell Pop he’s successfully made his case. Despite a string of murdered players the underdog St. Louis Cardinals will play out the final game of the season versus Cincinnati tomorrow, for the pennant. Death on the Diamond is a decent murder mystery set on the ball field. What distinguishes it is that it is also a better than average baseball movie. Besides the authentic era uniforms MGM even went to the trouble of sending a special director to St. Louis to take background shots of Sportsman’s Park, where the Cardinals played at that time. Barring the sometimes painful comic exchanges between Nat Pendleton as the Cardinals catcher and Ted Healy’s vision-impaired empire, most of the baseball banter goes over. Beyond The Pride of the Yankees (1942) Hollywood’s Golden Age isn’t exactly ripe with strong baseball tales. The best of the bunch, like Gary Cooper’s Lou Gehrig, are also based on real-life ballplayers: Ronald Reagan as Grover Cleveland Alexander in The Winning Team (1952) and James Stewart as the tragic Monty Stratton in The Stratton Story (1949). While each of these films vary in biographical accuracy the baseball is generally palatable to fans of the game. Death on the Diamond came several years earlier. It was released during 1934’s pennant stretch, in September, not long after the beginning of the enforcement of the Production Code. Off of the screen the Gashouse Gang was born in St. Louis and the Cardinals not only took the pennant but would also win the World Series come that October. Their Death on the Diamond rivals, the Cincinnati Reds, finished last that season. Period newspaper ad for Death on the Diamond. From The Miami News, September 17, 1934, page 6. Death on the Diamond was based on a novel by Cortland Fitzsimmons, who also wrote the football murder mystery 70,000 Witnesses (adapted by Paramount in 1932). MGM had originally planned Robert Montgomery, then Franchot Tone, to star. When Tone was assigned to another film, MGM cast the extremely active Robert Young as cocky starting pitcher, Larry Kelly. 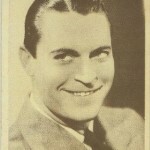 The film was directed by Edward Sedgwick, an old hand who began in movies as an actor in the 1910s and, according to Film Daily, played a scene with Paul Kelly in Death on the Diamond. It appears to have been cut from the finished film. Madge Evans plays Young’s love interest, Frances, daughter of the Cardinals owner-manager, Pop Clark (David Landau). But one thing murder mysteries and sports teams have in common is a lengthy roster and so Death on the Diamond winds up having more of an ensemble feel to it. The Nat Pendleton-Ted Healy pairing, often with batboy Mickey Rooney in tow, features almost as prominently as the Young-Evans love match. David Landau is as tired and gruff as usual as the budget slicing owner-manager of the team, but at least for once he’s not the heavy. Paul Kelly plays sportswriter Jimmie Downey, who becomes so suspicious of C. Henry Gordon’s notorious gambler, Joe Karnes, that it begins to feel like Jimmie may have an ulterior motive in trying so hard to pin the murder on organized crime. Besides Young and Pendleton the other Cardinals players are played by lesser known actors such as Ray Mayer, Ralph Bushman (formerly on the screen as Francis X. Bushman, Jr., after his famed father), Robert Livingston (before he shortened to Bob and became a cowboy star), and the most familiar face, Joe Sawyer, in a larger than usual role as the Cardinals’ star slugger. I get the feeling these actors were chosen on athletic ability, as none of them embarrassed themselves on the playing field. No, they didn’t play as well as professionals, but they passed muster in the few shots showing them pitching or swinging the bat. As did Pendleton, who looked natural in his catcher’s gear, and even Young, despite an exaggerated wind-up and a motion that was helped out in editing by speeding up his whiplike sidearm delivery. The Cardinals players knew they were in danger by that point. The first bit of trouble comes during Spring Training when Mickey the batboy notices somebody messing around with the Cardinals’ gloves. Pop calls the team doctor over to have a whiff and it turns out somebody has plied their leather with “some sort of alkaloid,” so nasty that its heat would have penetrated the flesh of the players and put them out of action for months! Meanwhile Kelly’s journalist, Jimmie Downey, spots a familiar figure in the stands. He walks up to razz Karnes (Gordon), top dog of that gambling crowd, suggesting, “Any place away from home is healthy for you now, isn’t it?” Back at the hotel the reporter later spots the new star pitcher, Larry Kelly, getting out of Karnes’ car. “Says he’s a sucker for baseball,” Kelly explains. “And vice versa, if he can manage it,” replies Downey, explaining that Karnes is one of the biggest gamblers in the country. Once the season is underway gambler Karnes becomes nervous after preseason odds on the Cards plummet from 20-to-1 to 3-to-1 with some big bets coming in along the way. A good part of this success is due to the emergence of Young’s Larry Kelly. With his ownership in jeopardy Pop Clark went all out to find the money to bring Kelly in and the kid might just save the ball club for him. Back at the hotel the other players happen by Kelly’s open door and get a kick out of watching him trying to fix his delivery. Young does a nice subtle job in fixing an issue with his off arm before spotting an envelope on his bed. A note outside the packet advises that he’ll lose tomorrow’s game. His teammates are surrounding him by the time he has the ten thousand dollars out of the envelope and into his hand. “Ten thousand dollars. Man, could that lift a load of Depression,” says Sugar Kane (Mayer). Kelly and company report the attempted bribe to Pop and everyone agrees that for the good of the game and his own reputation Kelly must win tomorrow’s game. Kelly excels, perhaps a bit too much, and somebody doesn’t like it. A phone call is placed after Kelly is spotted getting into a cab with Pendleton’s Truck Hogan. A rifle pokes out the door of a car that follows. The ballplayers' cab flips into a ditch and Kelly is out of action with a couple of strained ligaments. It gets worse for the Cardinals. In a scene filmed in St. Louis before the start of an actual Cardinals game, their hitting star cranks a ball into the outfield but collapses to the ground halfway between third and home. The doctor immediately pronounces him dead. “What is it doc, heart failure?” Pop asks. “Shot through the heart,” the doctor replies. But despite their gunned down teammate the game must go on. Two games remain in the season with the Cardinals two back of their opponents, the Cincinnati Reds. And more of Pop’s boys are going to die as they chase that flag down the final stretch. How could you not root for these guys? Death on the Diamond is a neglected baseball title. Rarer than it need be. Any baseball fan who can survive the Pendleton-Healy banter* will really enjoy this movie. Mystery fans should like it as well. In fact, the only real problem is where the two genres join together. Bodies are dropping seemingly all over the place by the end of the season and yet the game goes on, no matter the body count. You just can’t tell the American people they can’t have baseball. No way. * Pendleton continuously gets under Healy’s skin (and ours) by calling him Crawfish. I have to admit this made no sense to me the first couple of times I watched the movie. Tonight I went to the slang dictionaries and I think they cleared it up. Apparently the tasty little shellfish is best known in nature for swimming or moving backwards when disturbed. In the mid-19th Century it caught on as a name to call someone who backed down or retreated from a challenge or battle. It was also used for a time in the politics beginning in this same era. So I believe Pendleton is basically calling Healy a wimp or, perhaps, more specifically implying that a ballplayer can bully him out of sticking to his calls as umpire. Nat Pendleton strikes a pose. Both Laura at Laura’s Miscellanous Musings and Kevin at Kevin’s Movie Corner enjoyed this one. I also found an impressive look at Death on the Diamond at The Ascetic Sensualists, a new-to-me site that reviews a wide range of movies from classics to contemporary titles. Death on the Diamond has yet to have a video release but the good news, as of this writing at least, is that it shows up on Turner Classic Movies schedule twice in the coming weeks: July 19 at 9:45 am EST, as part of a full slate of baseball movies, and August 13 at 6 am as part of 2013’s Summer Under the Stars tribute to our little seen batboy, Mickey Rooney. I do love a good classic sports film! Will have to check out this one. Maybe I’ll be able to catch it on TCM on one of those airings that you mentioned. Baseball movies all day on the first of those days, so plenty of sports action coming at you on TCM soon! Really enjoyed your detailed post, Cliff, and am linking to it in my weekend roundup. Many thanks for including the link to my post! Thanks so much, Laura, for the kind words and the pair of links!